From Granville Island Brewing out of Vancouver comes their new “Auld Skool Scottish Ale” the newest addition of the Black Note Book Series form Granville Island’s Vern Lambourne. 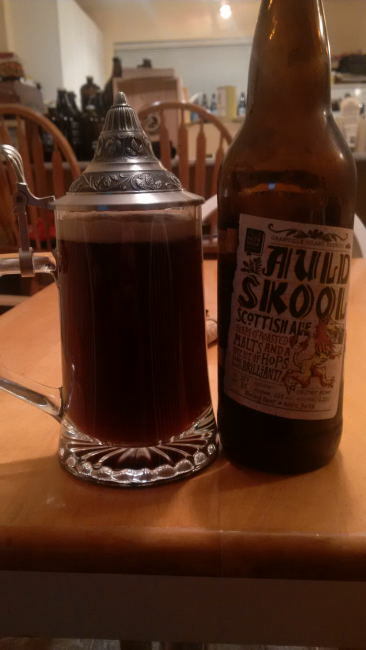 This Scottish Ale pours a deep ruby/brown colour with an off white head. The aroma consists of malts, caramel and floral hops. The flavour is of malts, caramel, roasted coffee, dark fruits, spices, earthy and some mild hops bitterness. The alcohol content comes in at 6.25% with an IBU of 20. The sweetness of the malts goes well with the caramel in this beer and makes for a well balanced Scottish Ale. Vern you have done a great job again! Food pairing as per the brewery: Its roasted and caramel malts pair perfectly with grilled, braised or roasted meats. Or you could always just enjoy it with some haggis. 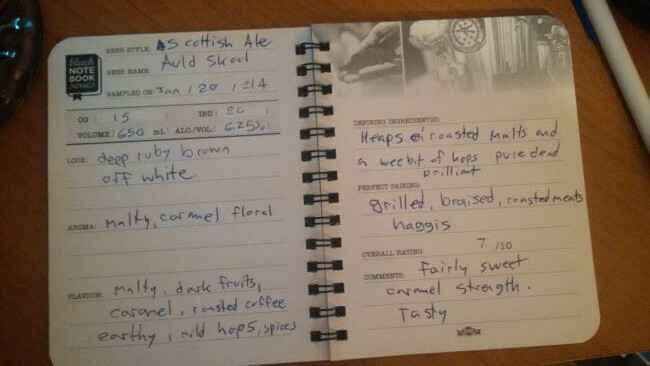 This entry was posted in Scottish Ale and tagged auld skool scottish ale, bc, black note book series, canada, caramel, coffee, dark fruit, dark fruits, earth, earthy, granville island, granville island brewing, hopped, hops, hopy, malt, malts, mild hops, roasted, roasted coffee, spices, vancouver.